From Little Vermillion Lake there are eight other lakes accessible. Four are accessible by land portages which range from easy to slightly difficult. The other four lakes are reached by creek under most water conditions. Other water conditions will demand a little more effort. Closs Lake: land portage is easy. Muskie and Smallmouth Bass dominate here. Very large Smallmouth Bass are caught each year: up to and over 5 pounds. Two people in six hours have caught 50 Bass; over half being between 16 and 20 inches. Muskie at Closs Lake is also plentiful with action at times to the tune of 13 boated in one days’ effort. What about size? Muskie from 25 to over 30 pounds have been recorded. Cedarbough Lake: This lake is accessible most of the season by floating through a small creek. Cedarbough is a very deep, cold-water lake that harbours big Smallmouth Bass, Muskie, Northern Pike, and Whitefish. Smallmouth Bass up to and over 5 pounds. Muskie fishing can be very fast at times. One guest boated 13 Muskie in one day. Northern Pike range up to over 20 pounds and Muskie are up to and over 30 pounds. Terry Lake: land portage is slightly difficult. Action for Northern Pike is extremely fast. There are no monsters here, but the action on light tackle is very exciting for all. Each year guests record catches of over 50 Pike in four hours or less. The three best catches were all over 100 Pike! George Lake: land portage is slightly difficult. This is our smallest portage lake, but what it lacks in size is made up for in its beauty and fishing quality. You can expect to catch only Northern Pike, but good size Pike. This lake has been rarely fished, and needs much more exploring. Booger Lake: land portage is slightly difficult. Only Northern Pike roam these waters. This long narrow beautiful lake will give any Pike fisherperson a thrill. Northern Pike will range between 3 to 8 pounds and can offer a lot of fast action, best recorded was 165 caught in 8 hours between three people. Maskinonge – Hooch – Cloudlet: These three lakes are referred to as Muskie Sanctuaries. They are connected to Little Vermilion Lake via a creek system, and were closed some 60+ years before being reopened in 1993. Smallmouth Bass, Northern Pike, and Muskie inhabit these waters. The fishing our guests have experienced in these three lakes can be described in one word: FABULOUS! Just about everyone fishing in these lakes has experienced the fishing day or catch of their lifetime. Many have had both. 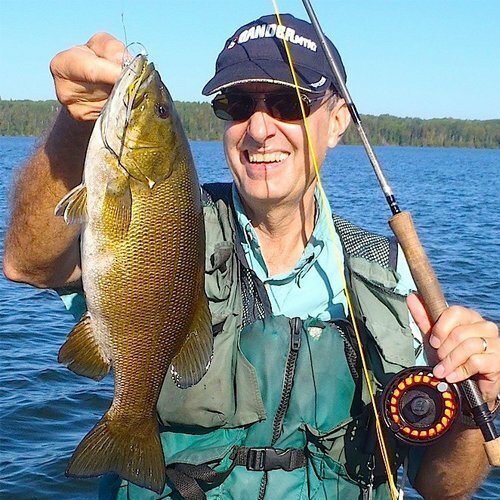 Smallmouth Bass between 4 to 5 pounds are very common. Northern Pike and Muskie ranging between 38 to 42″ are frequently caught. 2 people, 6 days, 37 Muskie, 82 Pike. Obviously we could go on with this forever so we will end here. We did leave out some of the more unbelievable catches, but if you would like to hear about them call 1-800-545-0815. The terrific thing about these lakes is that they are being managed as catch-and-release, barbless hooks only. This means that whenever you come to Fireside Lodge you can be assured the possibility of experiencing the type of fishing we’ve just described. We hope you enjoyed reading about our lake system and all it has to offer. Remember for your next fishing trip come where the fishing is great because we are keeping it that way. The Adventure Is Here And Waiting For You…. Come And Join Us!